SAN ANTONIO -- Julian Castro is a politician in not too much of a hurry. This does not mean he lacks ambition. The 38-year-old mayor of San Antonio, which has boomed into the country's seventh-largest city, came to national attention much as Barack Obama did, with a first-rate keynote speech at last year's Democratic National Convention. He spoke affectingly of life being not a marathon but a "relay" in which each generation lifts up the next. His metaphor didn't have the instant punch of Obama's 2004 red-and-blue America oration, but it does have staying power, just fine for a man playing the long game. He is looking toward easy re-election in May to his third two-year term, and you can expect him to resist entreaties to run for governor in 2014. Demographic change is not likely to turn red Texas purple until the last part of this decade. "No question it will be more hospitable" to a Democrat, Castro says with a smile. As it happens, he hits the city's mayoral term limit in 2017, nice timing for a governor's race in 2018 or a run against first-term GOP Sen. Ted Cruz. Castro rules nothing in or out, but he's not cagey. He sees a way up, and many Democrats hope he'll take it. And his "relay" metaphor was more than a rhetorical device. It describes his political life, and that of his twin brother Joaquin, a member of Congress. What makes Mayor Castro especially interesting is the interaction of his own pragmatism with the early radicalism of his mother Rosie, his first political mentor. She was a founder of La Raza Unida Party -- she eventually returned to the Democratic fold -- and a poster from his mom's unsuccessful 1971 city council race hangs proudly in the mayor's office. Between his mother's past and his own present, Castro embodies the full range of progressive impulses, from the most activist and visionary to the most practical and middle of the road. Castro says in an interview that it's not surprising that his approach is different from his mom's. "I had the blessing of opportunity," he says. As a result, he sees a balance in what is required to achieve change. "You need the folks in the boardroom who have consciences and the people in the streets who can picket at the right time." Then he gets to his own role: "And you need public officials who can listen. I see myself as a bridge-builder who can understand both sides." His goals for San Antonio certainly square with the objectives of any Chamber of Commerce member: "to create a brainpower community that is the liveliest city in the United States." The jobs he wants to attract, Castro says, are "the 21st-century jobs in information technology and security, new energy, aerospace." 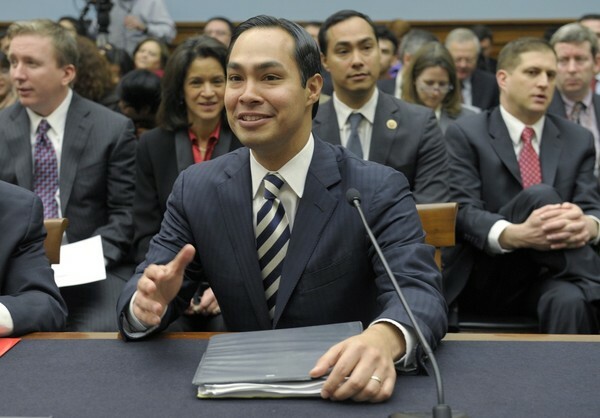 In keeping with his own trajectory through Stanford and Harvard Law School, Castro wants San Antonio's poorest teenagers to think big when it comes to college. One of his favorite initiatives is the nonprofit Cafe College, where parents and kids can get college advice and, in particular, help in filling out financial aid application forms. He notes that high schoolers who complete the standard Free Application for Federal Student Aid are "350 percent more likely to go to college." Castro is ahead of the curve on one major national issue, and has very hardheaded things to say about another. Obama has made universal pre-kindergarten a national priority, but Castro got there earlier, winning a one-eighth-of-a-cent sales tax increase in a referendum last November to provide about $31 million for pre-K programs. And Castro makes a case for comprehensive immigration reform rooted in the down-to-earth concerns of a big city mayor. Moving undocumented immigrants to legal status, he says, would mean "more children enrolled in school," less use of hospital emergency rooms, fewer unreimbursed ambulance fees, and greater public safety because "people will not be afraid to interact with the authorities." Yet however much local business people have come to like him, Castro is still Rosie's son. He remembers what it's like to be marginalized. "The only part of my mother's experience that still gets to me," he says, "is the way she and people like her were looked down upon for asking America to be America, for asking for full and equal participation in our democracy." Castro has pursued a methodical path to Rosie's dream. And he is earning himself the chance to push it even further than she might have imagined.